Gold is arguably history’s most sought-after precious metal – take a look at these 50 interesting facts about gold, and learn more about how to start investing in gold today for a bright future! One thousand tons of rock generally contains just 5 grams of gold…which equals serious scarcity! 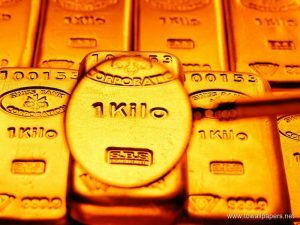 The current market value of all available gold in the world is $8 trillion in U.S. dollars. Gold leaf measures just 100 nanometers thick, or 1,000 thinner than a sheet of paper. 1,960 tons of gold is used each year for jewelry production. The equivalent of 50 million gold coins are used in gold investing each year. Just under 50% of all gold ever mined has come from Witwatersrand in South Africa. Aurophobia is the term for a fear of gold. Olympic medals were made from 100% real gold up until 1912 – they are now just 1.34% gold. The average human has about 0.2 milligrams of gold in our bloodstream. Today, Fort Knox holds about 150 million ounces of gold, or about 4,687 tons. All the gold ever mined from the earth would fit in a cube with 68’ sides. Gold has been found on all seven continents. The total amount of gold mined in recorded human history is about 161,000 tons. Every cubic mile of seawater contains an average of 25 tons of gold. The gold standard was the basis for Western economies until 1961. More steel is produced per hour worldwide than there has been gold mined throughout history. It is estimated that just 20% of the Earth’s gold has been mined. The word “gold” comes from the Old English word “geolu,” which means yellow. Switzerland was on the gold standard until 1999 – the last country to stick to this method. The most expensive gold coin ever sold is the 1933 Double Eagle – sold in 2002 for $7.59 million. Gold is the 58th rarest naturally-occurring element in the Earth’s crust of 92 different types. Pure gold is so soft it can be bent and molded with bare hands. Gold melts at 2,063 degrees Fahrenheit. Elvis Presley owned three Stutz motorcars and had all chrome parts re-plated in real gold. A standard gold bar measures 7” x 3 5/8” x 1 ¾”. One ounce of gold can be pounded into a sheet measuring 10’ x 10’. Gold is an incredibly effective conductor of electricity. The largest gold nugget in existence today is on display at the Golden Nugget Casino in Las Vegas – it was mined in Australia in 1980. India is the world’s largest consumer of gold today – much of it in jewelry. Gold nuggets can be worth more than the real value of the gold contained within due to scarcity of naturally occurring chunks. Alaska and California both rank gold as their state metal. Nevada and South Dakota are the US’ two largest producers of gold. Gold is believed to have been mined and used as long ago as 5,000 B.C. Scientists believe gold can be found on Venus, Mercury and Mars. Gold is sometimes injected into the joints of people suffering from rheumatoid arthritis. Astronaut helmets feature gold-plated (.000002 inches thick) visors to cut down on heat and glare. 90% of the world’s gold mining has taken place since 1848 (the Sutter’s Mill discovery). South Asian gold jewelry is generally 22 carats, rather than the more common 14 carats. Gold is the most ductile (able to be drawn into a wire shape) material known to man. Gold neither rusts or tarnishes, and will look the same for thousands of years. The largest gold bullion coin is produced by Royal Canadian Mint. It is 99.999% pure gold. Weighs 100 kg. with a face value of $1,000,000. Gold is rarer than diamonds, much rarer. The US holds more than 8,100 tons of gold in strategic reserves. The Mponeng Mine in South Africa goes 2.5 miles underground! 46 tons of gold is used annually for dental fillings. 60 tons of gold could make a wire that would stretch from the Earth to the Sun. Using the entire world’s supply of gold, you could cover all of Switzerland with gold leaf. All the gold ever mined would fit in 120 standard shipping containers. Gold has increased in value by about 500% over the past 15 years. These gold facts are fun to read, but the most important fact to consider is that the IRS allows smart investors to include gold and other precious metals-based IRAs in virtually any standard retirement portfolio. For more information about adding gold to your individual retirement account, contact American Bullion today.